Yao is back in Houston for the next two weeks to attend All-Star game festivities next week as well as to take part in Chinese New Year celebrations. He met with the Rockets’ CEO Tad Brown Tuesday morning to discuss details of the retirement of his jersey, then met with some of the current Rocket players, including Jeremy Lin. 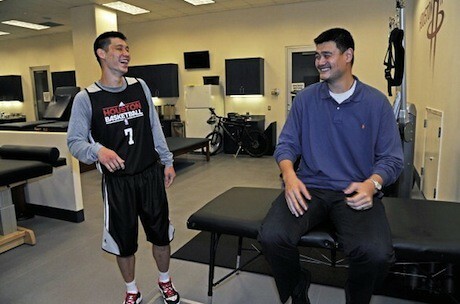 Click here to see more photos of Yao and Jeremy. Yao also plans to attend Friday’s game against Portland. This entry was posted on Wednesday, February 6th, 2013 at 6:22 am	and is filed under Jeremy Lin. You can follow any responses to this entry through the RSS 2.0 feed.